Description: Web Survey Methodology guides the reader through the past fifteen years of research in web survey methodology. It both provides practical guidance on the latest techniques for collecting valid and reliable data and offers a comprehensive overview of research issues. Core topics from preparation to questionnaire design, recruitment testing to analysis and survey software are all covered in a systematic and insightful way. The reader will be exposed to key concepts and key findings in the literature, covering measurement, non-response, adjustments, paradata, and cost issues. The book also discusses the hottest research topics in survey research today, such as internet panels, virtual interviewing, mobile surveys and the integration with passive measurements, e-social sciences, mixed modes and business intelligence. The book is intended for students, practitioners, and researchers in fields such as survey and market research, psychological research, official statistics and customer satisfaction research. The authors at ESRA 2013 conference, Ljubljana. From left to right: Vasja Vehovar, Katja Lozar Manfreda, Mario Callegaro. Comprehensive and thoughtful! Those two words beautifully describe this terrific book. Internet surveys will be at the centre of survey research for many decades to come, and this book is a must-read handbook for anyone serious about doing online surveys well or using data from such surveys. No stone is left unturned - the authors address every essential topic and do so with a remarkable command of the big picture and the subtleties involved. Readers will walk away with a clear understanding of the many challenges inherent in conducting online studies and with an appropriate sense of optimism about the promise of the methodology and how best to implement it. The authors guide us through the whole survey process and include modern developments, such as paradata and mobile surveys. A must-have for everyone planning an online survey. Read on and pick from the basket of useful pieces of advice that Mario Callegaro and his colleagues have put together! 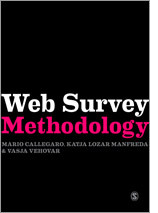 This is a very rich resource for practitioners and students within web survey methodology. This is an excellent, academic standard, book that every serious market researcher should own and consult. The authors have compiled an immense amount of useful and well-referenced information about every aspect of web surveys, creating an invaluable resource.